I am the true vine, and my Father is the vineyard keeper. He removes any of my branches that don’t produce fruit, and he trims any branch that produces fruit so that it will produce even more fruit. You are already trimmed because of the word I have spoken to you. Remain in me, and I will remain in you. A branch can’t produce fruit by itself, but must remain in the vine. Likewise, you can’t produce fruit unless you remain in me. I am the vine; you are the branches. If you remain in me and I in you, then you will produce much fruit. Without me, you can’t do anything. If you on’t remain in me, you will be like a branch that is thrown out and dries up. Those branches are gathered up, thrown into a fire, and burned. If you remain in me and my words remain in you. Ask for whatever you want and it will be done for you. My Father is glorified when you produce much fruit and in this way prove that you are my disciples. However, Jesus’ words here push back—quite forcefully—against this. 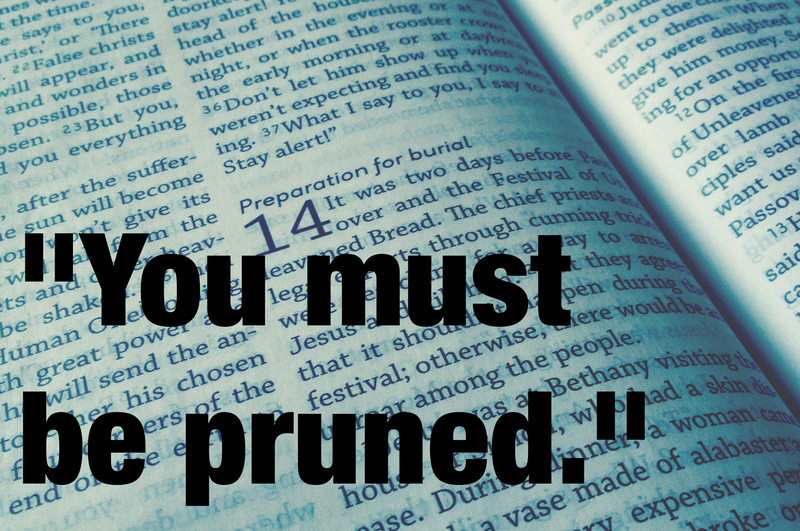 Pruning is not grafting: it’s not adding things onto a plant or a grapevine. It is removing things… quite abruptly. It doesn’t seem so pleasant, and yet “addition by subtraction” really does seem to be what Jesus is aiming for. The second aspect of this passage emerged when I was studying the Lord’s Prayer. A theologian pointed out that a common practice for growing grape vines was that a particular plant would be pruned for three years before it was allowed to produce fruit. Rather than rushing to produce, the vine was cut back so that its root system could grow deeper. I was struck by my attitude towards serving: my rush to “do something” for the church, and my impatience to make an impact. In contrast, Jesus says that before you do something, you need to be something: namely deep and rooted. Obviously, there are pretty profound implications for the way we lead people as well, specifically in how deeply we challenge people to grow, and how much to we emphasize who people are becoming as opposed to the things kinds of things they are doing. What are you prepared to cut away in order to produce? Have your roots grown deep enough to balance out the ministry you are involved with? Does your character match your call? Feel free to share, and also feel free to follow me on Twitter. This entry was posted in faith and tagged holy week, Jesus, spirituality. Bookmark the permalink.